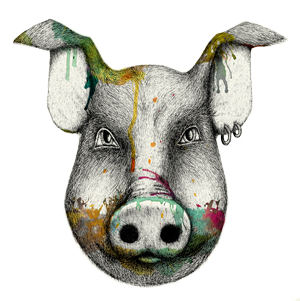 Welcome to our website (the ‘Website’), theunrulypig.co.uk, which is accessible via your computer or your portable hand-held device The Website is provided by The Unruly Pig (‘The Unruly Pig’, ‘us’, ‘we’ or ‘our’ for short). ‘you’ and ‘your’ means you as the user of our Website. 1.2 It applies to Information collected by us, or provided by you, whether in one of our restaurants, over our Website (including the mobile optimised version of the website accessible from your portable hand-held device) or in any other way (such as over the telephone). It is also intended to assist you in making informed decisions when using our Website and our products and services. Please take a minute to read and understand the policy. 1.4 The Unruly Pig is the data controller of your Information for the purposes of the Act and is a company registered under number 09333111. (c) by Information provided when you use our mobile optimised website from your portable hand-held device including details of your physical location, where you have agreed to it being used. 2.2 We may collect information about your computer, including where available your IP address, operating system and browser type and the geographical location of your computer for system administration, and we may report aggregate information to our advertisers. This is statistical data about browsing actions and patterns and does not identify you as an individual. 3.1 Similar to other commercial websites, our Website uses a technology called ‘cookies’ and web server logs to collect information about how our Website is used. A cookie is a very small text document, which often includes an anonymous unique identifier. When you visit a website, that site’s computer asks your computer for permission to store this file in a part of your hard drive specifically designated for cookies. 3.3 Cookies, in conjunction with our web server’s log files, allow us to calculate the aggregate number of people visiting our Website and which parts of the website are most popular. This helps us gather feedback so that we can improve our Website and better serve our customers. Cookies do not allow us to gather any personal Information about you and we do not generally store any personal Information that you provided to us in your cookies. 3.5 We may also use ‘persistent’ cookies which remain in the cookies file of your browser for longer and help us to recognise you as a unique visitor to the Website, tailoring the content of certain areas of the Website to offer you content that matches your preferred interests. 8.1 We maintain the highest standards of security. However the transmission of information via the internet is not completely secure. So, whilst we will do our best to protect your Information, we cannot ensure the security of your data transmitted to our Website. Any information you submit is sent at your own risk. Once we have received your Information we will use strict procedures and security features to prevent unauthorised access. 9.1 Please remember that when you use a link to go from our website to another website, our Privacy and Cookies Policy is no longer in effect. Your browsing and interaction on any other website, including websites which are linked to ours is subject to that website’s own rules and policies. Where we provide details of our restaurant menus, we make no promise that those details will be available in our restaurant on a particular day – all menus are subject to availability. You may link to any page of the Website for non-commercial purposes, provided that you do so in a way that is fair and legal and which does not damage our reputation or take advantage of it. For the avoidance of doubt, the linking site must not contain any adult or illegal material or any material that is offensive, harassing or otherwise objectionable. You must not link to our Website in such a way as to suggest any form of association, approval or endorsement on our part where none exists. You must not remove or obscure, by framing or otherwise, advertisements, any copyright notice, or other information published on the Website. Our Website must not be framed on any other site. 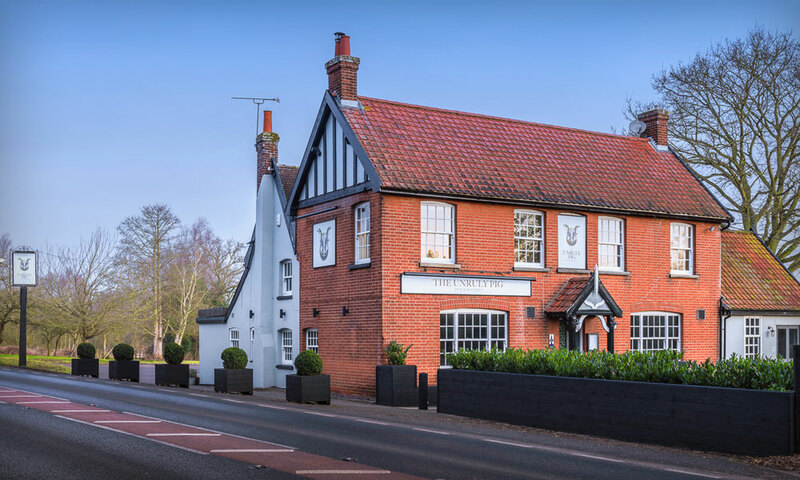 If you would like to link to our site for commercial purposes or any purpose not included above, please contact The Unruly Pig, Orford Road, Bromeswell, Nr Woodbridge, Suffolk, IP12 2PU. Our Website and/or the Materials may contain links to third party websites, for example Facebook and Twitter. Your browsing and interaction on any other website, including websites which have a link to our Website, is subject to that website’s own rules and policies including in relation to privacy. Please read those rules and policies before proceeding. If you find any content on the Website to be in any way offensive, obscene, defamatory, racist, harmful, inaccurate, unlawful, illegal or deceptive in any way, please notify us by emailing us at accounts@theunrulypig.co.uk using the subject heading ‘Objectionable Content’. To the fullest extent permissible by law we exclude and disclaim all warranties, terms, conditions and representations that might otherwise be implied by law in relation to this Website. In particular we do not represent or warrant that the Website will be error-free, free of viruses or other harmful components, or that defects will be corrected. You must take your own precautions in this respect. This website is provided for users in the United Kingdom only. Whilst access may be possible from outside the UK, this website is not intended for such use and such users access the website at their own risk.